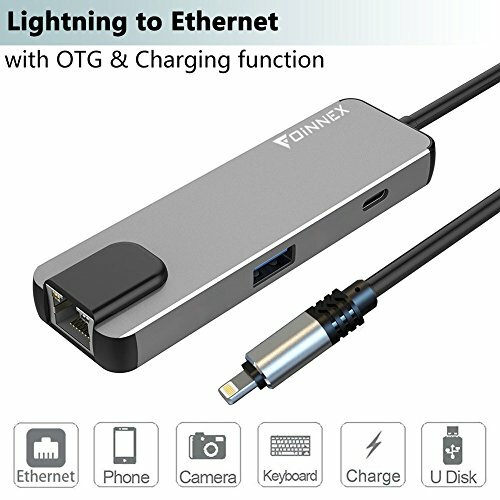 FOINNEX Lightning to Ethernet adaprer with charging and OTG function for iPhone/iPad. With USB 3.0 port, you can connect it with peripheral devices for more convenience. Attentions: 1. The lightning female port must be connected when you use the USB 3.0 with OTG function. 2. The current of peripheral devices cannot be over 100 mAh. You can download ChipGenius to detect the current of peripheral. How to connect your iphone/ipad to ethernet. B) Get the cable connected to your iPad/iPhone. C) Plug and play, don't need any other operation or any software driver and adapters. D) You also can plug a charger line into the side lightnig port of the product for charging simultaneously. How to transfer photos or videos from your camera or iPhone/iPad. A) Connect the adapter to your iPhone/iPad's lightning port. B) Plug a charger line into the side lightnig port of the adapter for charging. C) Connect your camera or another iPhone/iPad to the hub via an USB cable. D) Then your ipad or iphone will open the photos app automatically. a) The file, in which the photos are, shoule be renamed as DCIM(dcim). (the xxxx can be any four numbers). Then follow above steps. 【Lightning to Ethernet Adapter】Connect your iPhone/iPad to the Ethernet through a RJ45 wired LAN, you will get a high speed ethernet connection at 10/100Mbps and stable network when surfing on the internet or playing games. 【Power Charging Adapter】With the added charging port, your iPad/iPhone can be supplied power simultaneously when you work in office, play game, watch movies at home. You never need to worry about the power shortage when surfing on the Internet. 【Designed for iPad&iPhone】 With aluminum shell and Original Apple chipset, the lightning to ethernet adapter is durable and has a better heat dissipation, which will be more secure to your iPad/iPhone. Besides, the adapter is slim and compact, easy to carry anywhere. 【Wide Compatibility】Compatible with iOS 9.3 or later Versions (latest iOS 11.3). SUPPORT for iPhone 8/8 Plus/ 7/ 7 Plus/ 6s/ 6s Plus/ 6/ 6 Plus; iPad Air/Air2; iPad Pro 10.5-inch/ 12.9-inch (2nd Generation)/ 12.9-inch (1st Generation)/ 9.7-inch; iPad mini 4/ mini 3/ mini 2/ mini; iPod touch 5/6 etc. If you have any questions about this product by FOINNEX, contact us by completing and submitting the form below. If you are looking for a specif part number, please include it with your message.